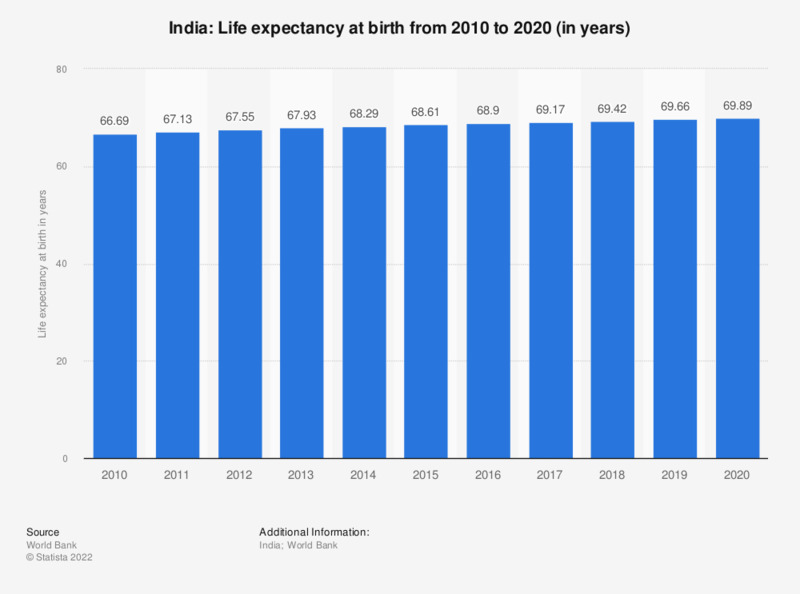 The statistic shows the life expectancy at birth in India from 2006 to 2016. The average life expectancy at birth in India in 2016 was 68.56 years. India is one of the so-called BRIC countries, an acronym which stands for Brazil, Russia, India and China, the four states considered the major emerging market countries. They are all in a similar advanced economic state and are expected to advance even further. India is also among the twenty leading countries with the largest gross domestic product / GDP, and the twenty countries with the largest proportion of global gross domestic product / GDP based on Purchasing Power Parity (PPP). Its unemployment rate has been stable over the past few years; India is also among the leading import and export countries worldwide. This alone should put India in a relatively comfortable position economically speaking, however, parts of the population of India are struggling with poverty and health problems. When looking at a comparison of the median age of the population in selected countries – i.e. one half of the population is older and the other half is younger –, it can be seen that the median age of the Indian population is about twenty years less than that of the Germans or Japanese. In fact, the median age in India is significantly lower than the median age of the population of the other emerging BRIC countries – Russia, China and Brazil. Additionally, the total population of India has been steadily increasing. Regarding life expectancy, India is neither among the countries with the highest, nor among those with the lowest life expectancy at birth. The majority of the Indian population is aged between 15 and 64 years, with only about 5 percent being older than 64.